Think of a pinball machine, the kind with the little steel sphere that rockets off the end of the plunger, a bundle of kinetic energy that bounces and careens and ricochets off the bumpers and over the triggers, making lights flash and bells ring and things go whirr until it runs out of momentum and slips through the return slot. Then another ball flies out and the pandemonium repeats itself. “I get bored easily,” said Chef Cathy Zeis. When a person or a product suddenly appears all over the place, the term “overnight success” often wiggles its way into the press and publicity. It is rarely true, of course, but the back-story does not always come to the fore. For Cathy Zeis, the pinball machine image is a good one—a lot of flash and bells, with more than an occasional slip into the return chute before coming out like gangbusters again. She is from San Angelo. Her father worked for the telephone company, and when his job took him to Connecticut while she was in high school, she went along. “I loved it up there. It was the first time I had ever seen snow.” After two years, it was on to Fort Wayne, Indiana, about which, the less said the better. Well, maybe not. There was at least one memorable event during her Hoosier sojourn. After a year in Indiana, Cathy went back to San Angelo to stay with her mother and finish high school. She went to Angelo State for a semester. She didn’t know what she wanted to do, but going to school just then wasn’t it. Her dad was in Dallas by that time, so she moved to the big city and took a job as a waitress at Bennigan’s. Bennigan’s was a big, national chain, and when they introduced a new dish, they would bring in a top chef in the field to make sure the restaurants got it right. Cathy got the chance to learn from the best—great chefs from New Orleans for Cajun, from New England for seafood. “I was in the right place at the right time, and I really learned from some great chefs,” she said. Cathy ricocheted off the restaurant business and back into school—the Art Institute of Dallas. She graduated with a degree in music and video and spent the next two years promoting and booking country and western bands in Dallas and Fort Worth and eventually Nashville. “I met a lot of good friends and worked with some people who became pretty well known. I enjoyed that too, for a while.” The “for a while,” is the key phrase here, so she went back to San Angelo. The bounce off the music business put Cathy back in the restaurant trade in her hometown. “There was a local restaurant called Crystals that wanted me to be the general manager, so I took them up on it,” she said. “It was a very creative place; they introduced a lot of new cuisine.” It was a management job, not cooking, not what she wanted to do, so the after six months, it was back to the nightclub whirl for a while, but …. You can guess the rest. At this point, Cathy was a résumé writer’s nightmare—experience galore, too much for many positions, and a checkered work record that scared the wits out of personnel managers. She was out of work, and prospects were anything but promising. So she did. She went to a local TV station and got a job as a producer for $5.25 an hour. In six months, she was the executive producer of the 6:00 and 10:00 news casts. That is where she met her husband, Randy, the station’s assistant news director. When he took a job at KTEN in Denison, the couple moved to Pottsboro. If this were a play, it would only be the end of the first act. There’s more to come. 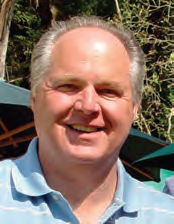 Talk Show Host Rush Limbaugh. Randy Zeis left KTEN-TV for a job at a station in Dallas. The couple had only one car, so while Randy made the daily commute, Cathy stayed home and made jams and jellies. She was pregnant with son Charlie at the time, so the landscaping at the nursery was out, but the homemade preserves she was selling at the nursery were beginning to draw customers back for a second helping. This was in 2000, and one day Mary Knox of the Pottsboro Press came in and asked if Cathy would write a cooking column for the weekly paper. “I jumped on that,” she said. “It got my name out there and helped sell the jams and jellies.” Eight years later, she is still writing the column. When Charlie joined the family, Cathy left the job at the nursery for a job in the nursery and became a stay-at-home mom. That was all right for a while. “When you’re home all day with a baby and no car, you’ve got to be creative,” she said. “When he took a nap, I would get in the kitchen and play with my salsas and put them in jars. I’m from West Texas, and I like them hot.” When Charlie woke up, she would put him in the stroller, pile on all the jars of sauce the buggy would hold, and set off on foot selling salsa to the businesses of Pottsboro. It was not long before Channel 12 came calling, asking Cathy to do a television cooking show. She did not consider herself a performer, but the station persisted, and in a short time it was “lights, camera, action,” in Texoma. “I went into people’s homes, created a menu, prepared the food, labeled it and stuck it in the refrigerator with instructions on how to serve it. When Charlie became a toddler, I couldn’t take him into people’s homes. I had to find a stationary place to cook, so I started looking for a restaurant.” On August 25, 2003, the Walk-in-Chef opened in a former doughnut shop on Main Street. When a buyer for the business—the location not the idea—approached Cathy, the Walk-in Chef walked out. This time it was not a matter of “it was all right for a while …” This time is was for a bigger dream. As the reputation of the Walk-in Chef had spread, Cathy had discovered that the lake crowd was buying her salsas, sending them to friends all around the country, and coming back for more. Why not distribute the products on a national basis? 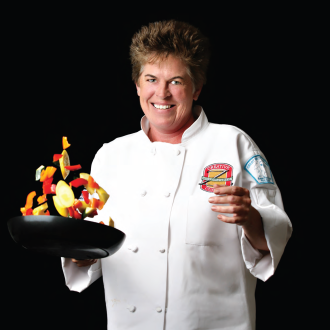 Cathy Zeis, pardon, Chef Cathy Zeis, was ready for the moment, and now, when the pinball shoots down the board, all the lights start flashing.